When most people think of “gingerbread” they imagine ornately detailed lattice work. However, there’s another version of gingerbread that includes the exterior siding. Wavy-edge siding, or gingerbread bevel, is siding that is sawn and textured with wavy (non linear) edges, giving the overall appearance of a Hansel and Gretel cottage. Wavy-edge bevel will give a cabin a rustic appeal. The look is warm, inviting, and oozing with charm. Gingerbread siding isn’t the same on every home. 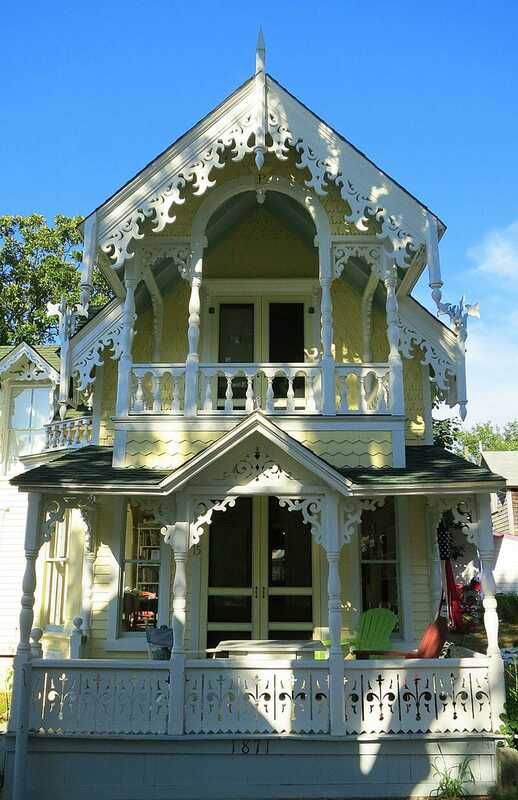 The owners of Victorian homes all wanted to be unique and more elaborate than their neighbors and that led to a variety of styles and the use of many different materials. Today you can find gingerbread siding made from standard wood like in the old days or more modern synthetic materials designed to stand up to weathering more effectively. 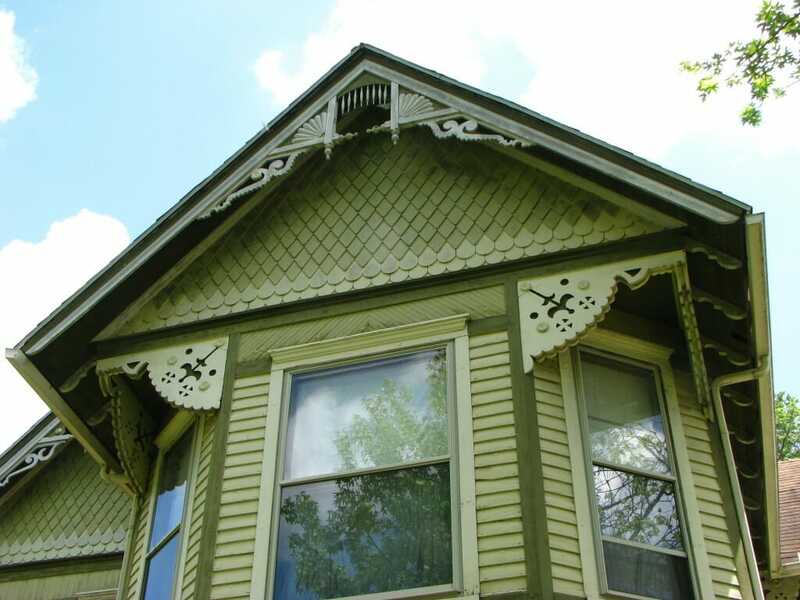 Gingerbread siding as trim was most popular in the mid to late 1800’s when the economy was booming and money wasn’t an issue. During that period wood was the material of choice to make gingerbread siding out of. It could be intricately cut and formed to just the shape needed for the design envisioned by the homeowner and the builder. Unfortunately while wood siding lasts a long time when maintained properly, and it looks very nice, it’s a lot of work. Relying on wooden gingerbread siding means grinding, scraping and sanding off layers of paint and repainting the surface about once every four to eight years, depending on conditions. Wood also happens to be more expensive than most synthetic products are. When you consider that those cheaper products are going to be simpler to maintain and maybe even last longer than wood, they begin to look better and better. The one thing that wood has going for it is authenticity. If you want a historically correct home, wood is the only way to go. 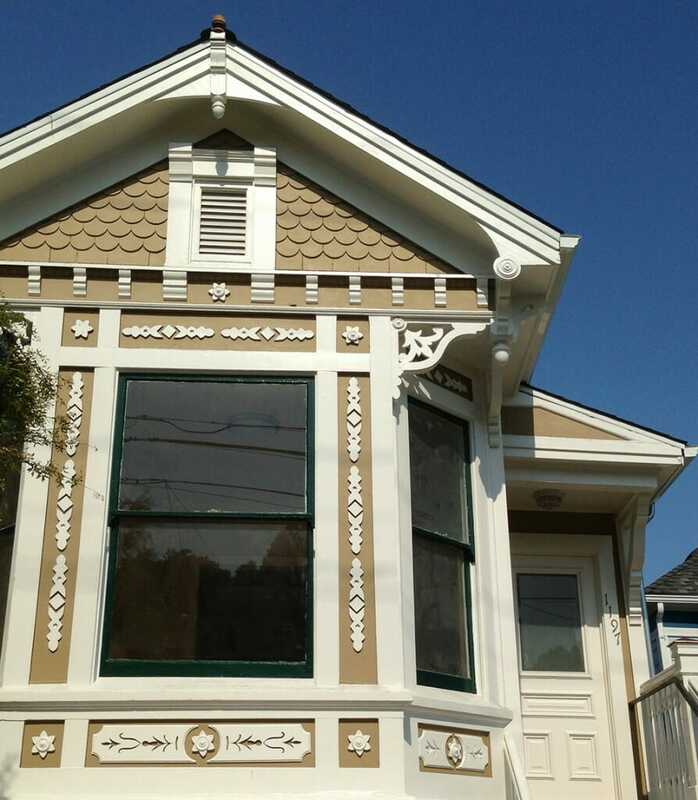 That’s how many people feel about their Victorian homes and why you can still find many adorned with wood siding. Fiber cement siding is one of the most popular synthetic material choices for use as gingerbread siding. The material can be cut and shaped just like wood can to recreate any of the original designs on an old home, or to mimic the designs used on a newer home. The material is also much less maintenance than standard wood is. That’s because fiber cement does not contract and expand nearly as much as solid wood. When you paint fiber cement the paint is going to remain in place for a much longer period of time without the contraction and expansion that wears paint off on more traditional wood siding. Another material that’s commonly being used on homes with gingerbread siding, to create the same accents and achieve a similar look as the old wooden-clad homes is cellular PVC. This is PVC that’s nearly the same as what’s used in plumbing pipes, but it’s in a nice flat shape and contains cells or air pockets to make it lighter and also enhance its insulation rating. This material is very easy to shape with saws and other cutting tools and it isn’t too difficult to install. Unlike many other siding products it’s highly waterproof even without any paint at all. Once painted you would be hard-pressed to tell this material apart from standard wood, and when installed properly it looks very nice. While vinyl is not the most popular option for recreating the gingerbread siding look, there are some vinyl gingerbread siding products available today. They come in a limited range of colors, but they are notable because they are affordable and simple to install. A homeowner looking for less maintenance than what wood will provide can go with vinyl to save money over the other options listed above, and still achieve decent results. The main downside with vinyl is that it tends to age faster than most other synthetics, and it doesn’t look quite as much like the original wooden gingerbread siding unless you take the time to paint it, but if you do that you lose the maintenance advantage it has. Both maintenance and durability of Gingerbread siding depends on the material used to make it. Traditional wooden siding can be very durable when maintained properly. That means painting it regularly to keep the weather off it. Painting should be done at least once every ten years and more frequently than that to keep up a nice maintained appearance. When dealing with Fiber Cement or PVC the maintenance is even less. Paint tends to adhere longer to these products and they are made to last even longer out in the sunlight than wood. If taken care of properly. That means that you’ll have less work to keep your home looking nice, and it will remain in better condition for longer before you have to consider replacing the siding with something new. Vinyl is the unique product on this list because it doesn’t require much maintenance at all while it’s up. Sure it will wear out faster because it’s not getting protected continually with new layers of paint, but until it does wear out it really only has to be washed off once and awhile and re-caulked around the J-channel joints. As long as these tasks are completed the siding should hold up for its expected lifetime, which is somewhere between 25 and 40 years according to authorities like Red Beacon. Wooden siding is one of the most expensive siding options on this list and it will cost between $500 and $800 per square of siding depending on the type that’s used and how ornate it is. This is a pretty significant investment and house with 1,500 square feet of exterior walls would cost between $7,500 and $12,000 just in wooden siding alone even before installation costs. Traditional Vinyl siding typically costs between $200 and $300 a square while scalloped siding can cost as much as $300 to $400 a square. When you price that out over the same 1,500 square feet of wall space you get a pretty reasonable 4,500 to 6,000 for the material before the installation. According to Homewyse PVC siding costs between 340 and 450 per square. That brings 1,500 square feet of materials to between $5,100 and $6,750 and then there is installation to consider as well which won’t be cheap with plenty of shaping and designing necessary. According to Homewyse basic fiber cement siding will cost between 250 and 350 per square and the full house example we’ve been using would cost between $3,750 and $5,250 approximately before installation costs, but installation costs would be significant because many of the pieces will have to be cut to achieve the gingerbread look. Not only do you have to pay for the siding itself, but you’ll also have to pay to dispose of the old siding if there is any, and for the installer to put on the new stuff, unless you’re going to tackle the job. Wood siding is likely the most expensive to have installed, while vinyl is the most affordable, but the only way to find out what it’s going to cost in your area is to get in touch with a local contractor. Talk with several in the area and get bids to figure out what a fair price to pay for the service really is.